Attribution correctly detects the source that attracted users to your app and accurately correlates an app install with a click on an ad. 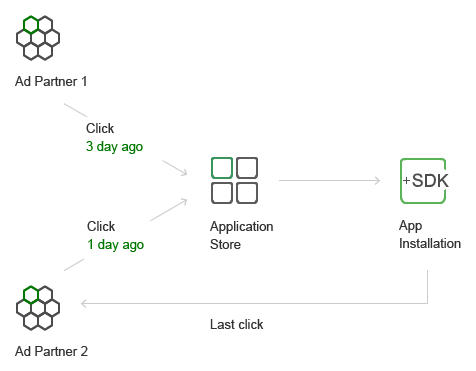 AppMetrica uses the “last-click” approach when linking an app install to a click. This helps avoid multiple attributions and attributes the install to the last media source that brought the user to app installation. Let's look at an example of an app that is promoted through multiple advertising partners. To ensure accurate and precise attribution, AppMetrica restricts the time between the click on an ad and the app install. By default, the timeframe for using Device Identifier Matching or Install Referrer is 10 days, and for Device Fingerprint Matching it is 24 hours. You can change the timeframe when adding a tracker: from 1 to 10 days, and from 1 to 24 hours, respectively. If the time between the click on the ad and the app install was longer than this setting, the install is registered as organic and isn't attributed to the media source. To make the conversion tracker report as accurate as possible, AppMetrica performs click deduplication. Deduplication uses the value of the click_id parameter in the tracking URL. If this parameter is omitted or null, the click is considered unique. Otherwise, AppMetrica searches for a matching click_id from this media source in this tracker over the past 7 days. If matching click_id's were found, the new click isn't counted (it isn't shown in the report and isn't linked to installs). In AppMetrica, reattribution is attribution of repeat installs by pre-existing users from advertising channels tracked using AppMetrica. Reattribution is disabled by default. If reattribution is disabled, new installs on a device that previously had attributed installs are registered as organic installs. The reattribution policy can be changed in the tracker settings. When reattribution is enabled, installs on the same device might be attributed multiple times to different sources. AppMetrica supports setting a list of test devices that always have reattribution allowed. This can be useful for testing advertising campaigns before a launch.